Blocks encapsulate a unit of work (a segment of code) that can be executed at any time. In other languages these they might be called "closures" or "lambdas". If you're familiar with function pointers, just swap the * for a ^. As an argument to a method, a block acts as a callback or a way to customize a method or function. Better than function pointers, blocks are defined where the method is invoked. You don't have to add a method or function and the implementation is defined right where you're using it. // Notification-handling code goes here. Blocks allow you to write code at the point of invocation that is executed later in the context of the method implementation. Blocks allow access to local variables. Rather than using callbacks requiring a data structure that embodies all the contextual information you need to perform an operation, you simply access local variables directly. Using FMDB as a front end to an sqlite database. The latest version of FMDB uses a queue to manage access to a database and lets you provide a block to specify the block you need to happen. I want to query the database to get find out how many items are in my database. FMDB lets me provide a block for what I want to happen with the database (db) whose access is managed by the queue (self.queue). My count variable is in scope for the block to read, however I want to modify the value of count and return it outside the block. In order for changes to count to be available, I have to mark it with the __block storage type modifier. I prefer to use property within a class so that I know that I'm using accessors and not touching the ivar directly, so my code is littered with self.thisProperty and self.thatProperty. However, in order for self.thisProperty accessor to be triggered from within the block, self would have to be retained by the block, causing an unbalanced retain which will turn into a memory leak! Solution? Use a local variable. Because blocks are portable and anonymous objects encapsulating a unit of work that can (often) be performed asynchronously, they are a central feature of Grand Central Dispatch. Last month I was asked to present at iPhone Dev Camp #6. I gave the organizer a few topics that I'd had some recent experience with that I thought would be relevant and three were selected. When I checked the Dev Camp website, however, I could see that I was listed as presenting "Lesson 99". So I decided to run with Lesson 99 as a theme. This is my compilation of notes and opinions as influenced by search results indicating that Lesson 99 was Beekeeper Or Bee-haver . See also Part 2 and Part 3 for the other topics. 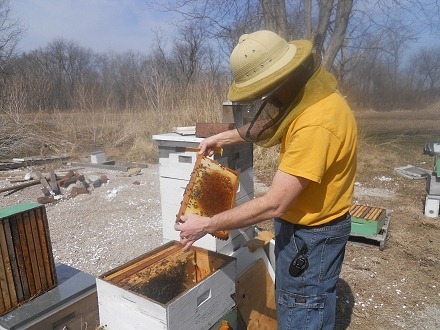 A BEE-HAVER is someone who can say they “HAVE” bees but they do not want beekeeping to consume their time or interest, so they spend little to no time keeping bees, they simply have bees. That’s certainly one approach. Then there are those who want to evolve from just having bees to truly doing all they can to make sure their bees are as healthy as possible. AKA "Stop making your keyboard cry!" You should be able to skim my code and quickly see what happens in each class. methods with multiple parameters should have the method name interleaved with the parameters. This lets the method name describe the parameters. Selectro name includes all parts of the name, including the colons. This fundamental difference in method naming in ObjC may be difficult to grok at the beginning but improves code readability and should give you hints as to what parameters are required. The behaviour should definitely be clear. Getters should be the name of the ivar/property, and shouldn't include the term "get". Be descriptive. Objective-C and Cocoa are designed to read well. Beware of methods starting with new, copy, create – they imply specific memory management and may confuse ARC (and other developers!) Note: create has implications for CoreFoundation and CoreGraphics code (not necessarily Obj-C). The things that happen when you tap a button. The method name is the response, not the state. The identifier IBAction indicates the action that will happen not the action that did happen. By defining the state in which you expect a method to be used, you're immediately and artificially limiting any other use. You're also giving no cues as to the behaviour of the code in the method. What happens when the blue button is pressed? Do you care that the button, 3 revisions ago, used to be blue? Will the sender always be blue? Login? a TouchUpInside? If you name it per proper convention, then its no big deal when 3 different buttons are all connected to smokeTheHive or when the button that triggers showSettingsPopover: gets changed 36 times over the course of the project - their actions that will happen are always clear. Define constants for strings used for notification names and dictionary keys. By using string constants the compiler can perform verification. And a non-literal improvement coming in Xcode4.4 is that @synthesize becomes optional! Its less work – my knowledge of effective retain/release patterns are like old war medals – well earned and give great perspective, but not something I want to use all the time.